"I'd put my money on the sun and solar energy. What a source of power!" That's a famous quote from Thomas Edison, the legendary inventor of the lightbulb and electricity distribution systems, in 1931. It's only taken eight and a bit decades, but his prediction is finally beginning to look prescient. In case you didn't notice, there is a bit of a solar revolution underway globally. And to use a mixed energy metaphor, it's gathering steam. Governments from California to Germany are pinning their hopes on solar energy as a cleaner source of power, while advances in battery and solar PV (photovoltaic) technologies are enabling people in Australia and elsewhere to go off the grid. Solar gained another influential supporter this week in the form of the research department of UBS. The investment bank's energy analysts made some staggering predictions about solar power Fairfax Media's energy reporter Angela McDonald Smith reported. UBS said solar could account for a quarter of the world's installed power generation capacity by 2050, and that it could eventually replace nuclear power and coal as the default energy source of the future. Locally, Origin Energy has said solar can rival new wind for cost competitiveness by the end of the decade in Australia. One of the common criticisms of renewable energy sources like solar is that they require huge subsidies from governments to be economic. Well, UBS has a riposte to that as well, as this chart shows. "Perhaps against 'common sense', global subsidies don't appear an excessive burden," the analysts write. Subsidies will peak at about €70 billion ($110 billion) by 2025. But that would be just 0.03 per cent of global GDP, and at they point they would begin to decline, as new cheaper facilities replace older ones, and as technology and scale benefits kick in. 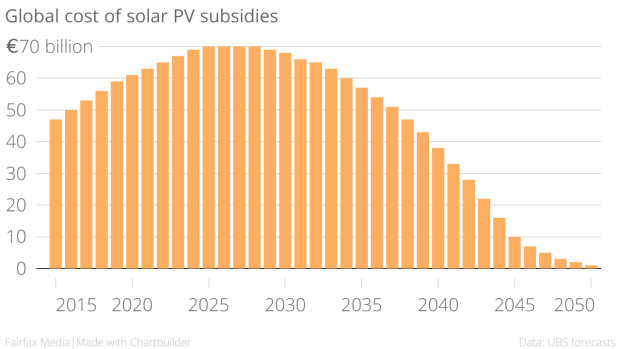 At some point between 2045 and 2050 subsidies will basically be negligible. If UBS is right, solar's future does look very bright indeed.